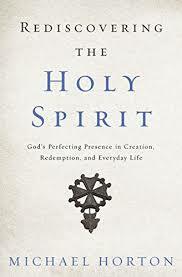 Michael Horton’s Rediscovering the Holy Spirit is a carefully-wrought work which re-organizes much of the material we expect to find in a doctrine of the Holy Spirit. In it, Horton connects some things that are too often bifurcated while distinguishing some things that are too often conflated. Horton’s pneumatology pushes and pulls on some of our habitual categories because it attends so carefully to the Holy Spirit as the one who not only reconciles and perfects (the sections on the Spirit in creation and eschatology stand out), but also sanctifies and separates (the Spirit’s role in judgment and consecration is strikingly accented). It is wonderful that Horton says considerably more here about the Holy Spirit than we have heard from him in previous books, but it is equally wonderful that what he says is in keeping with the main lines of his theological project: Horton’s pneumatology has all the marks of his overall systematic theology: Anchored in the Trinity, spanning redemptive history, and directly connected to the ordinary ministry of the church. I would like to use Horton’s pneumatology as an opportunity to examine a perennial issue in Christian dogmatics: the Holy Spirit’s paradoxical centrality for Christian life and thought. What is paradoxical about the Spirit’s centrality is that he is everything, and yet he is not the focus of attention in the Bible itself, in Christian theology, or in the experience of believers. The reason I consider Horton’s Rediscovering the Holy Spirit as an especially instructive case study for this subject is that this volume is a striking instance of a prolific and accomplished theologian who has not shrunk from teaching the full counsel of God on the full range of doctrines, and yet who has had relatively little to say about the Holy Spirit in previous work. I don’t want to overstate this: Horton has of course written about the Holy Spirit at the appropriate places in his various projects in systematic theology; in The Christian Faith: A Systematic Theology for Pilgrims, there is discussion of the Holy Spirit. But Horton does not make pneumatology central or structural to that systematic project in such a way that readers would identify it as a prominent feature of the book’s scope and vision. In the four-volume covenant series from Westminster/John Knox, in which Horton worked out some of the key commitments of his theological vision, the Spirit is also not prominent. The most superficial way to make this claim is to point out that Spirit is not a category in the titles of any of the volumes: Covenant, eschatology, Christ, salvation, and the church are the leading motifs and the determinative loci in that series, and I think it is fair to say, in Horton’s theological vision. Beyond his main contributions to systematic theology, Horton has produced a number of shorter studies, journal articles, and contributions to edited volumes. In some of these he has turned attention to pneumatology; I think especially of his chapter in Kelly Kapic’s 2014 volume on Sanctification, a rich and profound essay entitled “’Let the Earth Bring Forth . . .’: The Spirit and Human Agency in Sanctification.” Nobody could have written that fine essay without having devoted serious and patient attention to pneumatology over a considerable course of time. I could go on making caveats and concessions for some time here; nevertheless I consider it obvious that when we think of the theology of Michael Horton we do not think of pneumatology primarily. When Michael Allen and Scott Swain invited him to contribute to their volume Christian Dogmatics, they wisely asked him to write definitive introductory chapters on ecclesiology and eschatology. When the same editorial dynamic duo commissioned a Horton volume for the New Studies in Dogmatics series, they wisely asked for a treatment of justification. In both cases, this showed shrewd insight into the characteristic gifts and strengths of one of the major systematic theologians writing today. But those concessions, far from undermining my point, make precisely my point. This 2017 volume is a strong performance, a copious and prolific discussion of pneumatology that deserves wide attention and stands, in my opinion, among the finest work of a distinguished career. It combines in a unique way the depth and rigor of his academic work with the forcefulness and earnestness of his popular-level works. It reads at times like his book Ordinary: Sustainable Faith in a Radical, Restless World, and at times like a lost chapter from The Christian Faith. When Horton turns his attention, rather late in the game, to pneumatology, he re-states the same core theology that we know well from his other books, now in a pneumatological key, without taking some kind of pneumatological turn. In other words, Rediscovering the Holy Spirit is a standout performance and is the most sustained theological attention he has given to the doctrine of the Holy Spirit, but it does not revolutionize Horton’s theology. In the introduction, Horton says that “we need to take a step back every now and again to focus on the Spirit himself,” and he carries this out by exploring “the vast territory of the Spirit’s operations” (28). What I am particularly interested in here is what happens when an accomplished theologian takes that “step back” and revisits the structure of salvation history with an intentionally pneumatological focus. The main answer is: not much changes, but everything is enriched. More on this pneumatological enrichment in a later post.